"Horrible tragedy! Jealousy, murder, arson and probable suicide. A well-known citizen murdered in cold blood! A wife strangled by her husband. A city chapter of blood and horror.” Sealy Library’s recent rare book acquisitions includes this compendium of horrific deeds committed in the “Queen City” of Cincinnati, with its vibrant culture, but also a city beset by the mayhem of the Old West. The author and compiler of Murder Will Out… by “An Old Citizen” (1867), but identified as Colonel William De Beck, chronicles numerous crimes, including child murder, lynching, spousal poisoning, riots, and other misdeeds. His cautionary tale introduction notes that “they of both sexes will find much that they thus must avoid—the commission of the first little sin, may be the means of bringing them to destruction.” He goes on to chronicle such incidents as the “Murder of S. Easton’s Little Son”; “Fannie French, the Cyprian, Shoots her Paramour, Devlin”; “The Notorious Maythes Family”; and many, many others. We in the criminal justice world are not exceptionally shocked by reading about these crimes. But in the middle of the book we come across accounts of two murders and a riot linked to the rising populist, nativist, anti-immigrant feelings that were then spreading across the United States. The influx of the Irish and the Germans in the 1850s gave rise to the “Know-Nothing” political party. Many cities, such as San Francisco, set up vigilance committees to fight the political control of Irish and German immigrants. New York, with half of its voting rolls populated by naturalized immigrants, formed the American Party (Know-Nothings), which advocated an exclusionary model to make it difficult if not impossible for foreigners, especially the Irish, to become naturalized citizens. Their platform included setting a long residency requirement (21 years), deporting immigrant paupers and criminals, and other measures. This rhetoric and these actions are all too familiar to our contemporary political situation, not just in America, but globally as well. In Cincinnati, the 1855 mayoral election featuring the populist, nativist candidate for mayor, James Taylor, editor of the Cincinnati Times, delivered inflammatory attacks on the Germans, which sparked a vicious assault by the nativist “Americans” on the German “Over-the Rhine” neighborhood. The Germans fought back successfully, leading to the Democratic candidate James J. Faran winning the election. 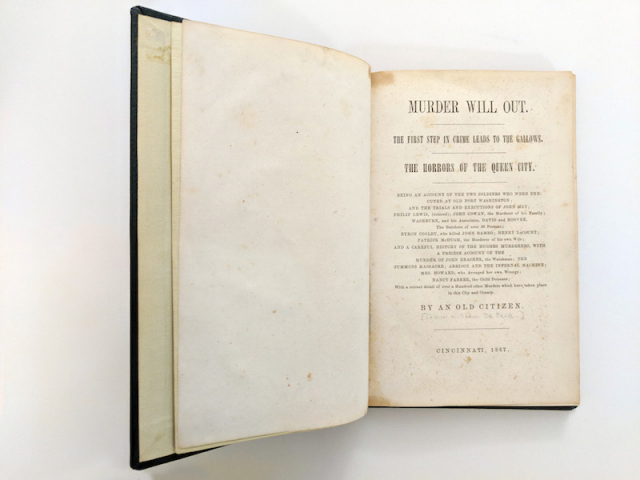 Murder Will Out... is available in the Special Collections Room, call number HV6534 .C5 D5.